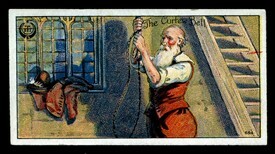 The practice of ringing the curfew bell (Fr. Couvre-feu, cover fire) prevailed throughout the continent of Europe at an early period, its object being that of preventing fires, which were very frequent and destructive owing to the houses being composed of wood. "It was not until the conquest of this country by William of Normandy that it was introduced into England, the object of it being to warn the people to cover up their fires, and retire to rest, so as to prevent any meetings of the conquered people being held; heavy penalties being imposed on all who did not attend to the signal. "The curfew bell was rung in the summer at sunset, and in the winter at eight o’ clock. "The custom of ringing this bell at eight or nine o’ clock is still [ie in 1870] continued in many parts of England, though its original significance is of course lost. "It is still rung at Bingham, Sutton Bonington, Wysall, and other places in the county. "At Wysall it is rung at eight o’ clock every evening, excepting Saturday, when it is rung at seven o’ clock, and on Sunday, when it is omitted. After the curfew has rung, the days of the month are then tolled on a large bell. "Mr. Prime, in his autobiography, states that about 1792 the curfew bell was rung at Bunny". This page was added by Edna Welthorpe on 31/01/2013. Thanks for submitting this article, Edna. I wonder if anyone can tell us the details of 'Mr. Prime's autobiography' referred to above?